Dr. DEANNA SWOBODA is Associate Professor of Tuba and Euphonium at Arizona State University, where she teaches tuba and euphonium, Entrepreneurship and Music courses, coaches chamber music, and designs creative music performances. Swoboda has taught at the University of Nevada Las Vegas, at the University of Northern Iowa, and University of Idaho. As an international performer and clinician she has been a guest at the National Conservatory of Madrid (Spain), Deutschen Tubaforum–Hammelberg (Germany), The Higher School for the Arts in Porto, Portugal, and the St Petersburg Conservatory in St Petersburg, Russia. As a clinician and performer, Swoboda has appeared at the national and northwest regional conventions of Music Educators National Conference (MENC) on numerous occasions, the Midwest Band and Orchestra Clinic, International Women’s Brass Conference, The Army Band Tuba Euphonium Conference, International Tuba-Euphonium Conferences, and for state music educator associations. 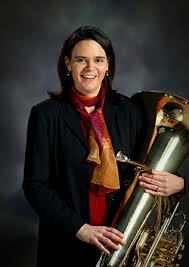 Deanna Swoboda is a Past President for I.T.E.A., the International Tuba Euphonium Association. Her mentors are Roberts Spevacek, Rex Martin and Sam Pilafian. Her solo CD, “Deanna’s Wonderland,” was released on Summit Records in 1999. Her solo CD is entitled “Shamanic Journey” and features the music of women composers. “Table for Three” is a new CD featuring music for low brass trio, recorded with ASU brass colleagues John Ericson and Douglas Yeo. It is available at Summit Records. “Fanfare and Flourish” is a quartet recording featuring the music of women composers. It is published by Potenza Music. Visit www.deannaswoboda.com for more information.